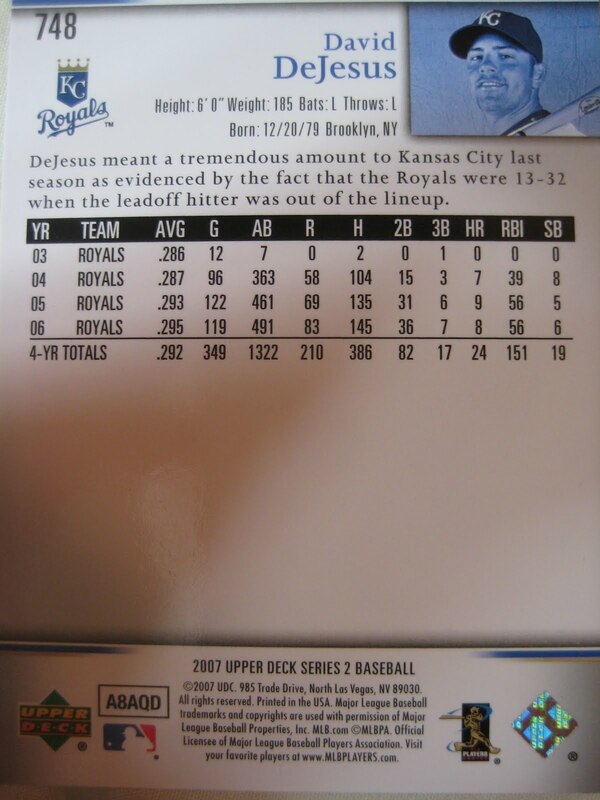 Rarely does a card give you as good a look at the scoreboard as 2009 Topps Luke Scott. The game is June 29, 2008. The score was tied 1-1 in the top of the ninth, as you can see in the picture, and there were two outs in the inning with Scott in the on deck circle. Scott did not get to bat that inning as Kevin Millar flew out. Scott did lead off the tenth and grounded out to second. Washington ended up winning in the bottom of the twelfth on a home run by Ron Belliard. "Tom's 40th b-day gift from wife: a website." Back in 1997 getting a website was a big deal. Here's what it looked like in 1998, courtesy of archive.org. Sadly, with Tom and Donna's divorce (possibly over such a lame gift? ), the site has fallen into disrepair. It is now a spam site hosted in Osaka, Japan. 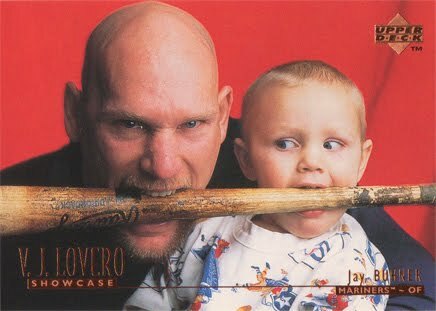 In yesterday's interview with Phil Ellsworth, he noted that when a player didn't have a bat for posed shots, he would use his own Derek Jeter model that he used in an adult wood bat league. You can tell the bat because of the black tape near the handle. 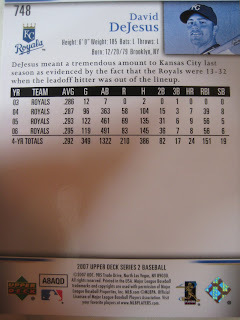 He sent me some examples that I posted yesterday, but I looked through my own recent Upper Deck cards and came up with one more: 2007 Upper Deck David DeJesus. Phil Ellsworth, owner of Phil Ellsworth Photography in North Carolina, is a long-time photographer for both Upper Deck and ESPN. He kindly spent an hour on the phone with me this morning talking about his career and many of his cards. He provided some great behind-the-scenes looks at the world of sports cards. - When did you first start taking pictures for baseball cards? 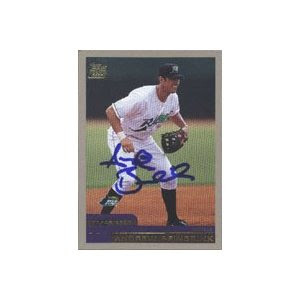 - My first assignments were for 2003 in Southern California for Upper Deck. I first started collecting card in 1985 - Topps football cards. I collected cards based on which photos I liked. I thought it would be cool to take pictures for a baseball card company. After college I started working for the athletic departments at Washington University and the University of Idaho. In 2002 I quit all my jobs and went to Los Angeles cold turkey to further my career. 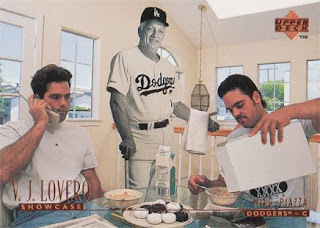 I walked into Upper Deck’s offices in Carlsbad in August of 2002 and they threw me out. 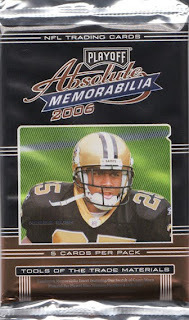 I was a long-time collector - had about 250,000 cards at the time. I had also been there two years earlier with a portfolio and they were more welcoming. This time they threw me out because they wouldn’t let anyone in without an appointment. On my way home from that Carlsbad trip, I stopped by the Anaheim Angels. I knew VJ Lovero was the Angels photographer. He was my idol - I collected the Lovero collection. He stared Upper Deck photography in 1988. 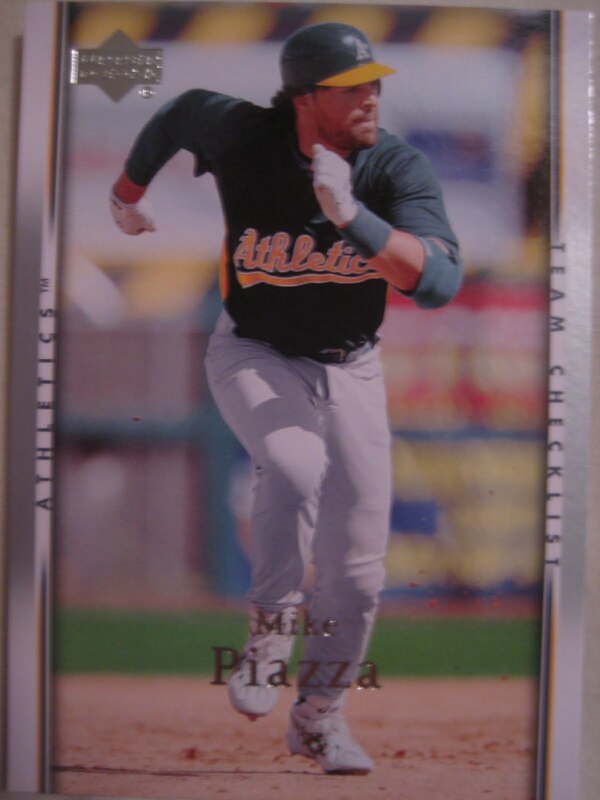 My favorite player was Mike Piazza. He had done a card eating cereal with Eric Karros. I stopped by the offices, told them I want to get my foot in the door and help out. They told me the Lovero Group does the photography there. The receptionist gave me his phone number. I was too nervous to call for a couple of weeks. Finally in mid-September 2002 I gave him a call, and we talked for a little bit. He said he could use an assistant right now. The final game of the season was September 29 against Seattle. He needed an assistant for the game, and said he would give me a tryout. Sports Illustrated paid for him to have an assistant for that game. The shoot went well – they won the game and made the wild card, and VJ wanted my help through the playoffs, which was great and I was working with my idol. At the time he was sick with brain cancer but still able to work. I chronicled him throughout the playoffs as they were his team that he had photographed for a long time. I photographed him in the locker room after Game 7 of the World Series celebrating with the team and during Mike Scioscia’s speech to the team. He was also the team photographer for the Anaheim Ducks who also went to the Stanley Cup finals that year. He was like a father to me. When he passed away in 2004 he left me his 400 millimeter lens in his will, an $11,000 camera lens. He left it to me to carry on my career. One of his best friends was Scott Clarke, staff photographer at Upper Deck and ESPN. VJ asked Scott to take care of me. When Scott had assignments with ESPN and couldn’t fulfill his Upper Deck assignments in 2003 and 2004 I went to those games and shot them for him. Eventually he told them, “You need another guy, sign this guy up.” In 2005 I signed a two year contract. Then in 2008 ESPN and Upper Deck moved to the east coast, and I moved out east with my family. Two years ago when they had their financial difficulties they did not renew any contracts. I am still doing some college basketball and football for them, not under contract. I recently shot LeBron James in Miami. I also went to Austin, TX to shoot USA Football. 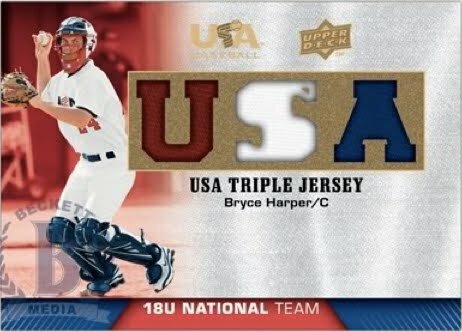 That same year I flew down to Miami to photograph the 16U team and Bryce Harper was on that team. When I went to Miami I was going to shoot a practice and do side portraits of each player. There is a photo in the 2008-2009 set of him fielding in the outfield rather than catching. I wanted a photo of him without all of his catching gear. I had him shagging flies in center field – I think he had to use someone else’s glove. I stood on second and took photos of him throwing the ball home. Gregg Forwerck, longtime Topps photographer and friend of mine, was over at my house this week. 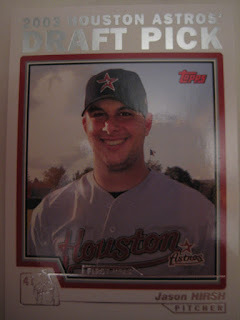 He told me a story about Lance Berkman’s rookie card that he shot – he was not wearing his uniform pants. He was leaning against his truck, that his wife made him sell soon after. In 2008, Upper Deck asked for some new ideas for rookie shoots. They had done shots of players jumping on a trampoline. One player got hurt and sued, so they changed to a bed. Upper Deck wanted something fresh and new. I came up with the idea that players would take their own photos. I set up a camera on a tripod with a foot pedal. 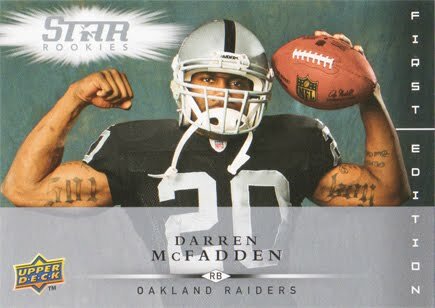 I own the Darren McFadden card – bought it off of ebay. If you see that card, he is flashing his tattooed biceps. Any card with the ugly blue-gray-green background, they took themselves. The best pictures you’ll never see because the pictures were inappropriate for a card. Matt Ryan did one with his helmet backwards. Rashard Mendendall and a teammate posed with their knees in shoes to make them look four feet tall. I was a little disappointed because Upper Deck went with the less risky shots. 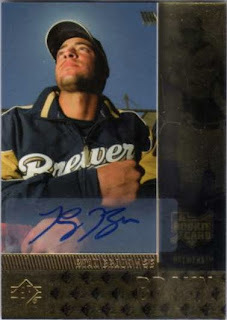 - My favorite cards were the 2005 MLB Artifacts set, my first card photos taken as myself. It was the fulfillment of a boyhood dream. I knew I wasn’t going anywhere shooting for colleges, I decided I was just going to do it, quit my jobs and go to LA and make it happened. Seeing these cards was the fulfillment of a dream, after taking a substantial risk with no money and no jobs. I went on ebay and bought some 1/1s. Also, I always wanted to shoot a card of Mike Piazza. I had been to some games where he was there but he didn’t play. In 2007, his last season, I went to Phoenix and he was playing and shot almost exclusively him. 98% of the game was Mike Piazza. I got a shot of him running from second to third that was used. 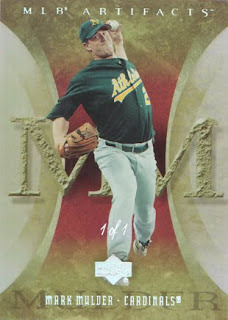 I bought a 1/1 printing plate of that card. Up to two or three years ago I was Upper Deck’s most produced hockey photographer. One of my favorites is Alex Ovechkin because he is nuts and fun to be around. Another favorite is Sidney Crosby. I was fortunate that Upper Deck paid me to go to Detroit to cover Game 7 in 2009. 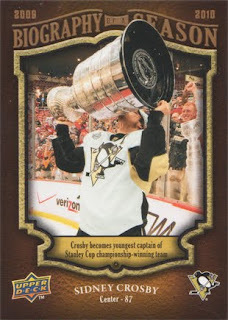 I have a shot of Crosby raising the Stanley Cup. I was shooting from an elevated position during the game and had ice access post game. After the game I was deciding whether to stay in the elevated position or go down to ice. When they did team photo I went down to the ice and just barely made it to get him lifting the up over his head, which was used on a card. For me the iconic baseball card photo is the 1989 UD Griffey. VJ Lovero photographed his card. He didn’t have a Seattle Mariners logo on his hat – it was one of the first cards to be digitally enhanced. In the card world it was clear to me as a photographer and collector that it was the beginning of the end of crappy cards. It wasn’t just the shiny stock but they put together a corps of elite photographers to make card images. 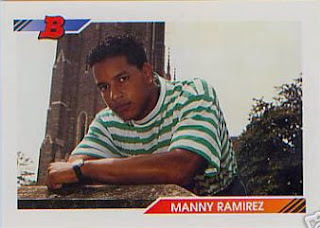 Some of the other cards I liked were the 1993 Bowman set where Gregg Forwerck got Manny Ramirez and Chipper Jones in street clothes in weird locations. He shot Chipper Jones in a salmon shirt in Duke University. I grew up in Seattle and Griffey was my favorite player. I was at the game where he made the Spiderman catch. Dairy Queen made a card of it which I could relate to personally as a collector and a fan. Another of my favorite of VJs was Jay Buhner and his son. Was tied in to a shoot done at VJ’s ranch. The Lovero set was my favorite by far. There are a lot of restrictions now compared to what you could do then. - Yes, most of the photography is now done in an assembly line at spring training. - I did not like those – am not a morning person. You had to wake up at 4 in the morning to get there to set up. None of the players wanted to be there. One exception was Jim Thome. You need to get them smiling, serious (game face), left and right profile. Jim Thome would not do game face – only smiling. I made a picture of Ichiro in a set where I had some baseball bats in. 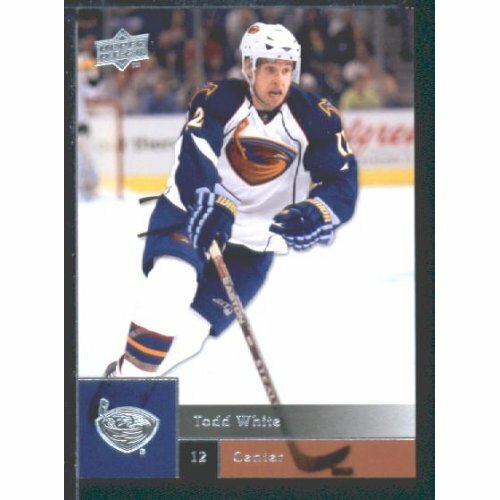 In the 2008 O-Pee-Chee sets, anybody you saw from the Mariners, Royals, a couple of other teams – I did. The funny thing is - I was in a wood bat league in California and I had a Louisville Slugger Derek Jeter bat. The bat had cracked and was taped with black photographers tape. Two stripes on this ash bat. When I went to these photo days, over a two year period, when a player didn’t have a bat I would use this bat. There are literally twenty or thirty cards of players holding my Derek Jeter bat. Took one of JJ Putz. Some of the USA baseball players. 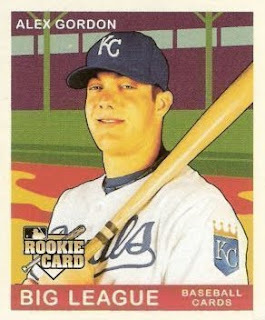 Alex Gordon and Billy Butler who were big rookies for the Royals. Ichiro wouldn’t use the Derek Jeter bat - he wanted to use his black bat which was fine. It’s a shame that the industry is deteriorating in a way that is bad for photographers. For example Getty Images is forcing Upper Deck and Panini to pull exclusively from their photo pool. This is bad for the collector because you have two card companies working from the same photo pool. They are having trouble getting what they need to get. 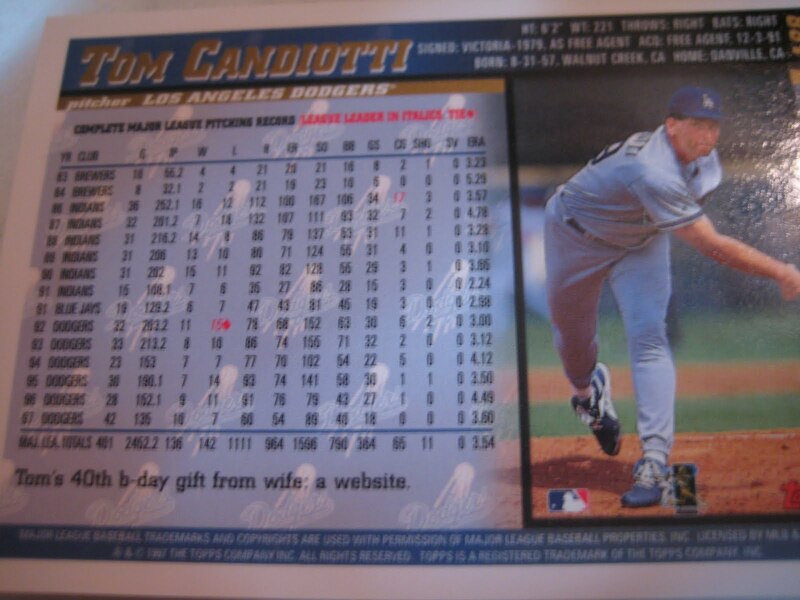 In 2002 or 2003 UD tried to get Getty to do their baseball card stock. But it was too difficult because they shoot editorial, mainly horizontal, and not vertical which you need for cards. I have a young son now and I try to keep the best of the best for him. I have some Mantle and DiMaggio auto jerseys and Griffey auto bats to give to him. Best thing I sold was a Hank Aaron 500th HR auto card – 1/44 – sold it for $1200. Another story – Gregg Forwerck was telling me that he photographed Manny Ramirez’s rookie card in his City League uniform. He was under a very tight deadline and had first shot him in his regular in his Cleveland uniform, and they processed his film wrong and it ruined the slides. And he was like “no, no, no,” and he called Manny’s agent, and he said that was great. 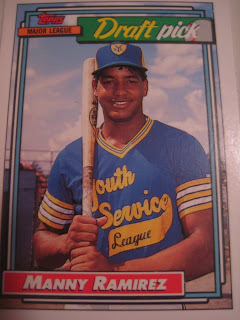 Apparently Manny was bent out of shape that he wasn’t photographed in his City League uniform. Gregg thought Manny would be upset when he came back and wouldn’t smile, but he was very happy. Another factor is how the photo fits into the design of the card, sometimes because of location of autograph, jersey piece, etc. 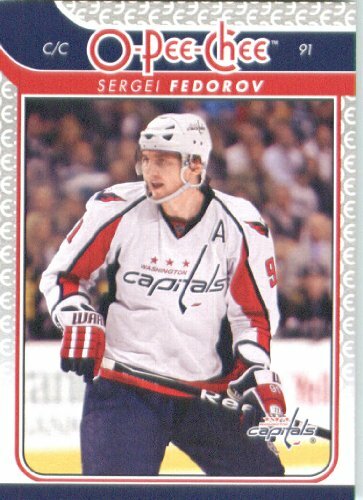 I got to shoot Sergei Federov at the end of his career with the Washington Capitals. I was told, “We only want him facing left,” which was a very strange request. I had to go in very early and request a specific location where I could get him facing left. Bottom line is I’m paid to be a photographer and not an editor. Sometimes you’d get some great editorial photograph of a crazy play at the plate that is great for Sports Illustrated but you can’t use for a baseball card because you can’t see the player’s face. You have to photograph the action a different way when shooting editorial vs. a baseball card. 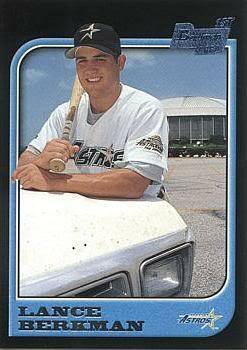 I shot Ryan Braun’s rookie card. I had lined up Ryan Braun’s head with the sun behind him to give him a halo effect. He was eating a bag of sunflower seeds, and he was leaning against the dugout guardrail. I think it was in SP where they used different photos in short-printed versions. Things pay off when you shoot things differently. Want to make cards memorable, something I would want to buy. Some of the cooler things I did was the packaging and the boxing, I always wanted to get those shots. One year I had every Sidney Crosby shot that was on a box and package. 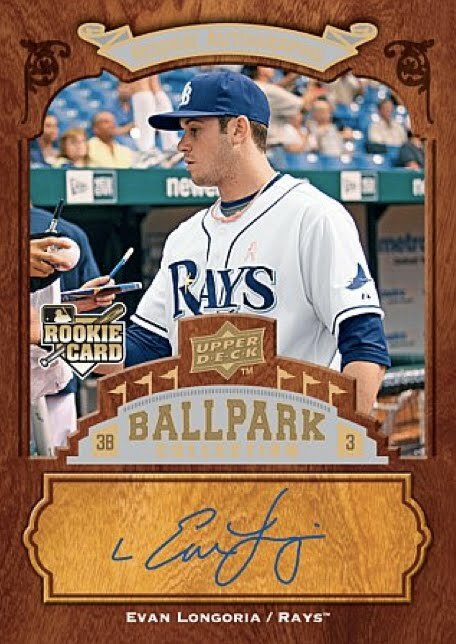 I shot the photograph of Evan Longoria in Series 1 2009. 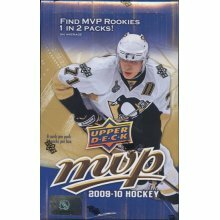 I have the MVP 09-10 UD Box – Evgeni Malkin – Game 7 of the Stanley Cup. 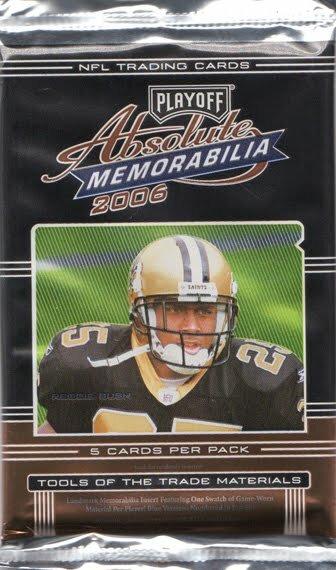 They also used the Reggie Bush photo in 2006 Absolute Memorabilia. I used to spend hours looking through the sets looking for which cards. 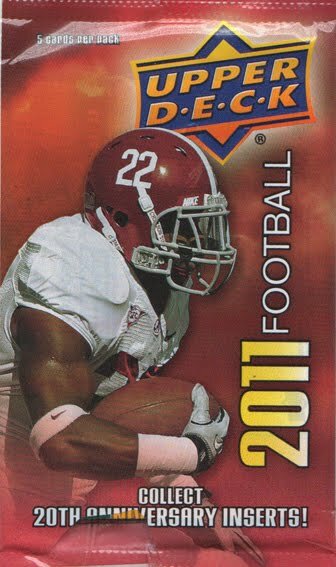 I have the picture of Mark Ingram on the brand new UD college football. 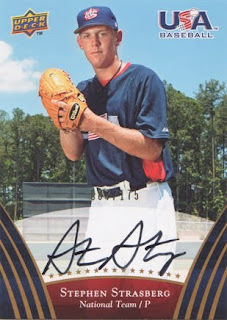 I shot the picture of Stephen Strasburg’s auto rookie. 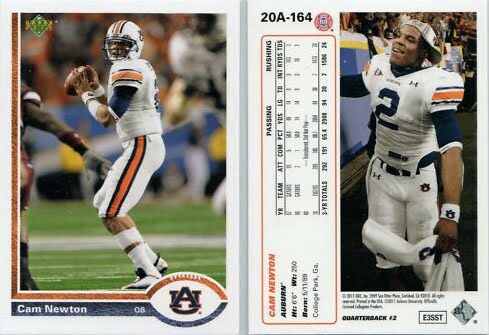 I kept bidding on the cards on ebay but it was too expensive. Fortunately, USA baseball sent me a box and I was lucky enough to pull the Strasburg auto rookie card. Brad Mangin is a San Francisco-based freelance sports photographer (Brad Mangin Sports Photography) whose work regularly appears in Sports Illustrated. He was the photographer for the 2010 Giants official coffee table book, "Worth the Wait." One of his first photography jobs was working for Upper Deck in the early 1990s. He kindly answered my questions about baseball cards. "I have not shot for trading cards in around 15 years. My favorite set I worked on was the Upper Deck minor league set from 1992 I shot tons of California League stuff for that set in San Jose, Visalia, Stockton, Bellingham, and Calgary. It was a great set with great pictures of the best prospects. I shot guys like Garret Anderson, Eddie Perez, Shawn Estes, Mike Piazza, Eric Young, Derek Lowe, Karim Garcia, Marty Cordova, and many others. I was born in 1965 and started collecting with my older sister in 1971 (Topps Supers). I still have all my cards. I used to collect and finally stopped over 10 years ago because there was just too much." 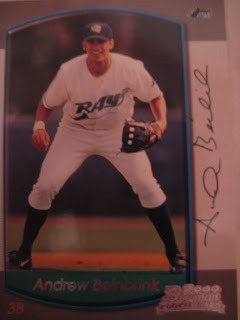 Andrew Beinbrink played six seasons in the Devil Rays and Rangers organizations. 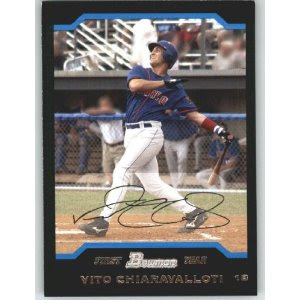 The right-handed hitting third baseman's best season was 1999, when he hit .339 with 11 HR and 51 RBI for Hudson Valley. Now the CEO of SportsForce, a college sports recruiting service, he kindly answered my questions about baseball cards. 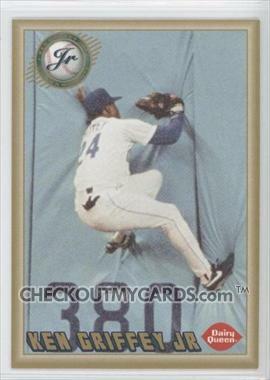 My favorite card of all time is the Ken Griffey - Upper Deck rookie. I have 3 of them and that is when baseball cards really starting stepping up in quality. 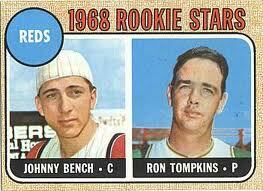 My other favorite card is my brother's Johnny Bench rookie. I don't collect anymore but I have a vast collection. 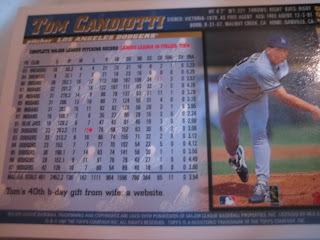 I used to be a subscriber to Beckett and went to card shows when I was in the 5th - 8th grade. When HS came around I stopped collecting in 1990 or so. I still have all of my cards organized and protected. Would be interesting to look through them one day to revisit those collecting memories. Now I'm busy running a sports company called SportsForce - http://www.sportsforceonline.com that assist student-athletes and families with their college sports recruiting and scholarship goals. Sports and helping athletes is my passion! Thanks! 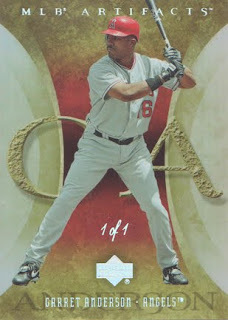 I don't have either the Royal or the Topps card, but here is a card of his I do have, 2000 Bowman. Mike Janes of Attica, NY is a professional sports photographer whose work has appeared on baseball cards for Topps, Donruss, Tri-Star, and Just. He owns Mike Janes Photography and is co-founder of Four Seam Images, a photo agency specializing in amateur and professional baseball. He kindly answered my questions about baseball cards. - Do you have any stories about cards that you took the picture for? I would be especially interested in any behind the scenes stories about individual cards. Most of the cards are action shots, so there's not many stories behind them really beyond long drives, sleeping in parking lots or crappy hotels, underpaid and overworked. Nothing too big with the players or weird happenings as of yet, sometimes guys don't care while others want to help pick the photo - even though we often don't have a say in which image will get used and the card company will just pick which one they like best, that could mean a portrait or action shot, just never know until the set is released. 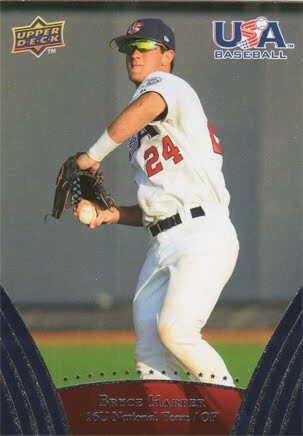 Chase Utley team issue rookie - the GM came down to the field telling me he was joining the team but the set had gone to print, so he called them and put it on hold. First thing Chase did in a Batavia uniform was come out to my smiling face waiting for him to go through some poses, pretty sure we developed the film immediately as we didn't even wait until his first at bat to get an action shot. Want to say the photo was to the printer by the time the game started, and being film days meant trips to the lab. 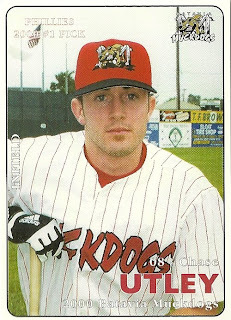 There was some new guy with Lowell while they played in Batavia in 2002, not on the roster though so I pretty much ignored him. He walked by me a few times before an autograph collector whispered to me that I should get his photo but to not tell the other photographer. So I grabbed the kid and did some photos down in the dugout, had to go back and get his name from the grapher later. The other photographer ignored the kid, didn't even bother shooting him when he went to bat. Was told later by an editor those were the first photos of him in the United States, and they had been looking for some desperately. 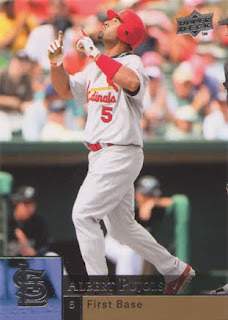 So one of the poses and the first at bat turned into Hanley Ramirez first cards put out by Just Minors. Honestly one of my favorite photos was never a card, though I desperately wanted it to be. I drove down to Utica, NY from college and found another photographer was there as well with the same intentions I had - get Adrian Gonzalez! Adrian had just gotten there and of course was who everyone wanted being the first overall pick. However, the pitching coach said we should also get the other guy that just got to town too, some skinny little 17 year old named Miguel Cabrera. Miggy did not speak English but he loved having his photo taken! Did a few portrait type shots, nothing great so I snuck out to third base before the national anthem to get him talking and joking with teammates, one of the pitchers saw this so got him laughing really good, big smile and then told him to turn towards me - instantly one of my favorite shots. He then posed for one similar just in case but a teammate by the name of Pat Magness was in the background making a weird face. Always wanted that for a card, the one without Pat, never happened. My first few cards with Topps stick out the most, not the best photos, just firsts. Vito Chiaravalloti, who won the Triple Crown in the NYP League, believe was my first card issued by a major company, along with Logan Kensing and Jason Hirsh....2004 Bowmans. I also made Vito pose with 3 bats for winning the triple crown, he was OK with it but not the most enthusiastic - that ended up being his Topps Cracker Jack card so was worth it. They actually sat him the last game just to make sure he preserved the crown. 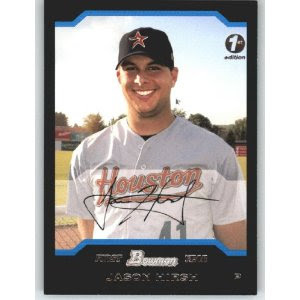 Hirsh is still a good friend to this day, with his card we were yelled at by the pitching coach to not go on the field because he was not in full uniform, which is a rule of the Astros organization - Jason ignored the warning and went to the bullpen area to do the photo instead - a very basic headshot that ended up being his rookie card, every time I'm around and he's asked to sign it he tells them to have me sign it as well - don't remember anyone taking him up on that offer though. Do not really have a favorite though, just some that mean something. 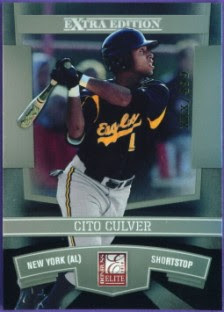 Like having the first few cards of a local kid who was drafted by the Yankees, Cito Culver, Donruss did cards of him in his high school uniform so it's nice to have taken those images of a local player. Strasburg's first card once officially making his debut in "AA" was an E-Topps issue from Harrisburg, all the hype around him was great to have been there to take his images for that, also had another Topps card that featured his instructional league debut. My personal favorites are the late '80's cards I collected when growing up '87-89 really - still have everything from then. I try to get the ones that have my images, however has become extremely difficult over the past few years. Beyond that not much anymore, did for awhile and still have all my old cards, just don't get time to go after new ones. 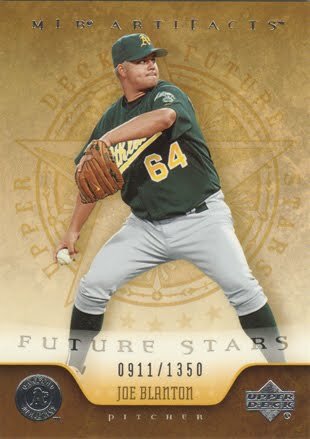 First boxes I bought in a long time were Topps Pro Debut last year to try and put together that set, but mostly because almost 1/3rd the set was my photos.